Malta is an ancient island with perhaps the oldest free standing "temples" on earth. These buildings are older than the Pyramids and Stonehenge. It is comprised of a few island but only 2 are large enough to support any amount of people, Malta and Gozo. But the number of Temples for such a small island is staggering. The island today is fairly dry and you can not imagine it being able to support a large population that would need that many temples at a time when others had not even started to build theirs. into bays full of sea water and they can be seen on the sea floor. The Temples themselves have evidence of "burning" (vitrification?). The population of Malta also vanished along with a lot of old civilisations around the same time. Another possible bit of evidence could be the animals found at the Ghar Dalam cave. 1000s of different types of animals, smashed to peices, packed into a cave. According to the Electric Universe idea of the Squatting Man or Tree of Life being a high energy plasma discharge, this would have affected the earth in such a way that dating systems using half lifes or the amount of certain chemicals in things could easily be wrong. So these animals may have been forced into this cave more recently than is thought of at the moment. I also have heard that the Temples themselves were found "pushed over" in the same direction, perhaps because of one of the catastrophe floods? It seems Sir Temi Zammit and Prof Agius noticed this and that temples had fallen to the East (if someone can confirm this that would be great!). Ghar Dalam has its mouth open to the West so this would fit in with the idea of one of the floods pushing animals in there. Another thought is that all the temples were found buried. On such a small island with no large mountains to be eroded where did all the material come from? corner of room with hole for large column and steps/stairs? Gebel Gol-Bahar submerged Temple? Is this photographic and video evidence of the underwater Malta Temple of Gebel Gol-Bahar? ** what catastrophe event destroyed Atlantis? Malta is a platform, an elevation of the sea floor that has showed its want to immerse more than once. Thirty-five pre-historic temples distributed on the two major islands, Malta and Gozo and many others actually submerged by the sea, make one think of a catastrophe that must have happened here around 3000-2500 B.C., something that left its sign. Steep reefs falling vertically to the sea, contrarily to the more sloping northern shore, form the southern coast of Malta, the Dingli Cliffs. It's as if the island's major axis rotated around itself, submerging most of the coast that faces Sicily. Some local archeologists, including the already mentioned Dr.Anton Mifsud and Dr.Charles Savona Ventura, consider this cataclysm to be the real cause of the Atlantis legend's birth, the history of which would re-emerge from a number of relics of the island's mysterious megalithic past. The population that created extraordinary structures of giant stones, at a certain point of the island's history, just disappeared. Two-hundred-and-fifty years of darkness actually characterize the story of these people until the arrival of the new populations that successively occupied Malta. What had determined such an immense catastrophe? Perhaps an earthquake or the subsiding of the calcareous platform on which Malta stands. However, we know from the Leningrad Papyrus, (a hieratic scroll dated 1115 B.C. conserved at the Hermitage museum) an Egyptian document composed around 2000 B.C., dating back to the XII dynasty, that a serpent populace was destroyed by a "star falling from the heavens". Only one survived on an island "destined to be completely submerged". What is this strange fable? Was it the record of a catastrophe that destroyed a particular Mediterranean region? The myth also connected the serpents to the figures of Mother Goddesses such as Tanit, Innanna, Isis and Eve. It is nevertheless known that a megalithic structure once existed inside Valletta’s Grand Harbour, at the foot of Fort Saint Angelo. According to Jean Quintinus, this temple extended over “a large part of the harbour, even far out into the sea” as late as 1536 and in 1606, Megeiser could still see that it was constructed of “rectangular blocks of unbelievable sizes”. Today, we know that the sea level in 5000 BC was no less than 15 metres lower than it is today; by 2500 BC, the water level had already risen by almost ten metres! Hence, rather than a sudden deluge that might have killed all, there is instead a slow sinking of the islands. As a radio frequency engineer, I find these possibilities fascinating, and while pondering them I had a bit of a revelation: Namely, A birds-eye view of the temple structure and configurations in Malta, in many ways closely resemble an antenna propagation pattern with it's main beam lobe, side lobes, and nulls (between the lobes). ....Exactly what is the unique and specific temple design layout of Hagar Qim based upon? What was the impetus and influence that dictated the architectural configuration so long ago? Again, when Hancock mentions in Underworld how the land gently dropped away for a great distance from a temple location, I couldn't help think how ideal that is for signal propagation when designing sites that can transmit great distances. Is it possible some ancient temple locations were chosen for similar reasons? If the temple location were part of some kind of communications network utilizing the EM Spectrum, I'd say they were. There are a few people who think that a lot of old cultures and their buildings were more intune with and used the natural power. One of the more famous long term investigations is Chris Dunn and his The Giza Power Plant theory. In THE GIZA POWER PLANT, I had theorized that harmonic resonators were housed in these slots and were oriented vertically toward the ceiling. I had also theorized that there was a hydrogen explosion inside the King's Chamber that shut down the power plant's operation. This explosion explained many other unusual effects that have been noted inside the Great Pyramid in the past, and I had surmised that the explosion had also destroyed the resonators inside the Grand Gallery in a terrible fire. Only with the powerful lights of the video camera did the evidence become clear, and illuminated before me, like at no other time before, was the charred evidence to support my theory. Evidence that I was not even looking for! Tarxien Temples, Malta - fire damage or the start of partial vitrification? This article seems to give evidence for either an explosion or Vitrification that has been found around the world from the UK to India, America and also perhaps the start of partial Vitrification of the "temples" of Malta. Re: Was Malta the island of Atlantis, the island of Temples that had a Catastrophe? I have been living on Malta for over 25 years. As a keen SCUBA diver, I can definitely confirm there are many, many artifacts and features, now submerged, that point to Malta being not only much larger in area, but also very well advanced. In addition, some of the "small" valleys, show evidence of being cut deeply into the stone by previously much larger water flows. ( example the valley running into Mistra Bay has at least 3 seperate Neolithic villages, and 5 relatively large scale "apiaries" for the production of honey. My last point is that the depth of silt in the Grand Harbour is in excess of 37 metres- this silt was washed from somewhere!- and the "rivers" that used to flow from these valleys, now submerged of course, were tributaries of a much larger river that was (is?) some 3 miles out from the Harbour entrance today. I have heard that there are cart ruts and temples offshore Malta but have only seen the ones at st georges bay as they are only a few meters off the shore! I have read about the submerged temple structure of Gebel Gol Bahar, that there are underwater cart ruts near st julians and also some near Fort Delimara. Have you seen or heard of any others? Malta as a larger island or area, due to rising/falling sea levels or a catastrophe that seems to have hit the whole Med at the same time? Most of the cultures around the Med also seeming to have abandoned or gone AWOL. With the temples it does seem to give Malta a good chance of being one of the candidates as Atlantis. The now "dry river valleys" or Wieds of Malta are very interesting, so wide and deep when they are mostly so short and not very high. How could a stream or river create such large channels? Something has happened or they have been terraformed by man. The fact that most of them seem to have no starting point just begin very large has always puzzled me. I had a look for something to explain it and the only suggestion I have found is that instead of an Ice Age, Malta had a Rainy Age, due to its warmer climate. Only in Malta! The problem with this is that it does not explain Ghargur and Madliena Heights. Virtually as high as Dingli Cliffs yet, according to geology, these are water carved Wieds or Valleys. How has water carved these out when there is so much wrong about these being water eroded. Mistra Bay, do you have more info on the stuff there? I find it an area of interest, a couple of reasons are that there appears to be some sort of large quarry or "depression" crater beside it and that the bay next to it has something very strange from an erosion point of view. When you visit the other bay it is very circular and it rises and curves smoothly up and down. What is interesting is the amount of earth below the cliff face, how high the actual stuff inside the bay is. There is so much there that the Maltese have even converted parts of it into small fields. How has the sea eroded the cliffs yet all this land remains inside the bay? Does this show that sea levels have risen/fallen quickly or is there another explanation? I have read about the Grand Harbour and when they were diving in it in the 60s they found lots of stalagmites on the sea floor, I don’t suppose you have ever heard if this is actually true or not. I suspect it is as it fits in with some other ideas and stuff I have seen and why would anyone make up something like that? Would you be able to explain further about the old rivers and the harbour? Is there historical evidence that Malta was Atlantis? The superb book Echoes of Plato's Island has a lot of historical and modern day evdience that Malta was the island of Atlantis. It quotes many historical sources. You dont even need to visit the islands of Malta and Gozo to understand that Malta has a lot of evidence for it being Atlantis. How and why are there so many temples on islands this small? Why do cart ruts lead off cliff tops and into the sea unless a catastrophe struck Malta? The book Echoes of Plato's Island gives lots more examples of flora, fauna, ancient maps and co-ordinates, historical finds etc as to why Malta was Atlantis. Anyone who has an interest in the subject needs to buy this book and if you can visit the islands. You wont regret it. Psonchis then proceeded to outline the most remarkable event in the prehistory of the ancient Athenians, when they had led the military forces of the eastern Mediterranean against those of Atlantika in the west. The defeat of the Atlantean forces was immediately followed by a cataclysmic disaster, which subnerged Atlantika beneath the waves for all time (48). "In comparision of what then was, there are remaining in small islands only the bones of the wasted body ... the mere skeleton of the country being left" (49). Psonchis also gave Solon several details about Atlantika before its submergence. The civilisation of Atlantika had been established for a millennnium in advance of the Egyptian one (50). I had lain close to the straits of Heracles in the western ocean (51). "Atlantiko was the way to other islands, and from these you might pass to the whole of the opposite continent which surrounded the true ocean; for this sea which is within the Straight of Heracles is only a harbour, having a narrow entrance, but that other is a real sea, and the surrounding land may be most truly called a boundless continent" (52). grand harbour velletta - erosion or electric discharge? As to the catastrophe that struck the island are they explained in an electric universe? Is the grand harbour of Velletta an electrical discharge event and thats why it looks like a lightning strike? If Maltas geology shows signs of being created by the EU catastrophe then can it explain the massive bays and the Dingli cliffs? what catastrophe event destroyed Atlantis? the above sounds absolutely mental and made up. but what if one of the greatest civilisations of ancient times, the Egyptians, had recorded similar events, planets getting closer to earth? and they did. so how in our solar system could this event have happened and did it or something similar cause the catastrophe that destroyed atlantis and the older larger malta? the above quote is from the discussion on the book Comet Venus by gary gilligan. the theory is that the egyptians pharaohs and gods were actually planet kings that moved around the solar system and interacted with the earth. no one knows exactly what catastrophe event destroyed Atlantis but if Malta is Atlantis then we need to look no further than the island and the surroundings. there is evidence of catastrophe around Malta but it depends on how you look at it, which EYEs you use. if you look at it in the stable solar system and earth we have at the moment you will struggle to understand what could have happened. if you look at it through electric EYEs you will see a whole new world and a the old world. the older earth and solar system appears to have been very different. the ancients myths/legends/drawings/writing seems like they were in a different world or universe to us, it makes little sense to the world we see today. thats because their world and solar system was very different. the skies were alive with planet gods attacking each other and sometimes the earth with cosmic thunderbolts. all the old civilisations write about this so why is it not true? but how can it be true? in a gravity universe it is not possible but in an electric universe it is not just possible it has to happen and will happen again. the sky has and will fall on our heads, dragons will roam the heavens devouring planets and the planets will be gods once more. if the planets have not appeared in the sky closer to the earth, fought with each other through massive lightning strkes and discharges then why were the ancients so fearful of the planets? why did they give those tiny specks in the sky, that do nothing apart from orbit, that you wouldnt know are planets, why did they make them gods that ruled the universe? so what did happen to Atlantis and the larger older Malta? A catastrophe appears to have struck the the Mediterranean area, the middle east and perhaps the whole world at the same time in varying degrees. this is the time of abandonment. great civilisations dissapeared. people left the cities and dwellings they had used for millenia. if it is an Electric Universe then when 2 electrically charged bodies get close to each other they will discharge. think about everytime you have had a static shock from touching a car or a metal cabinet. thats just you and the earth. now think of 2 planets? thunderbolts of the gods. this can also explain tunguska. grand canyon america and human - lightning strike victims? a increase in sea levels seems to have happened and a change in our environment. the earths weather is electric so any changes in the earth or the solar systems circuitry will drastically change our weather. but a increase in water level does not seem enough to wipe out Atlantis. but an increase in sea levels would also indicate that the legend of Atlantis and that malta was Atlantis might be true. is there any evidence of these planatery exchanges? the grand canyon in america looks like a lightning strike and on mars the Valles Marineris is an EDM event. if the catastrophe event that destroyed Atlantis was a thunderbolt of the god series of events then what evidence on what is left of malta is there? especially what Electric Universe and gEUlogy type evidence is there? There should also be some discharge pathways depending on the location of the craters. There should be plasma/electrical discharges that will be shaped like lightning. Hofra il-Kbira and Hofra iz-Zghira are 2 massive EDM crater bays. They curve up into the middle and then down again in a lovely shape. Notice the smaller "rim shot" craters on the side. Atlantis/Malta geology evidence - the inland sea and Dwejra bay. 2 EDM craters. the inland sea has a puzzling cave that goes from it out to the sea. how can this cave have been eroded away straight through the thick cliff yet not touched the rest of the cliff beside it? Unless it is an EDM crater. grand harbour velletta - erosion or electric discharge similar to lightning or lichtenberg figure? ** Il-Maqluba, Qrendi - the upturned crater that formed the island of Filfla? ** St Mark's Tower Malta - electric discharge or energy grid pathways? 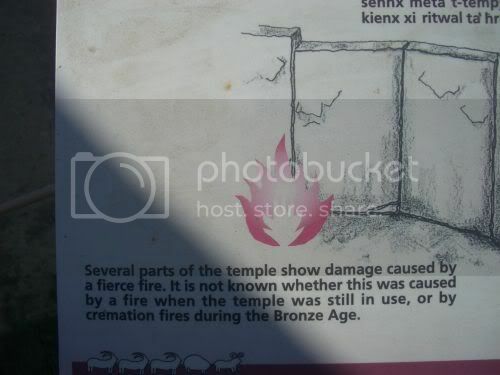 the "temples" of Malta have suffered from severe heat, without it appears raging fire type damage to the actual buildings or evidence of what caused it. this could have been caused by the effects of EDM or plasma discharge but as the temples dont seem to have suffered damage themselves that may not be the answer. what may have happened is if the temples were used and designed to harness the natural energy that flows through the air and the land. telluric currents for example show that the earth has massive natural electric currents flowing through the earth. not surprising for an electric earth in an Electric Universe. if a current flows through an object long enough it and the area around it can build up a massive charge, then when the flow of currents is suddenly stop the circuit suffers from back EMF (counter-electromotive force, back electromotive force, counter emf). a massive surge back through the system. you witness this when your fridge turns off and the lights or tv suddenly blink. is there any other evidence of high energy heat or burning around malta? on top of Qolla Safra in Gozo there is burnt material of different colours and quartz is found on the top and sides of this strange twisted knoll. in the book Echoes of Plato's Island they mention a local ash layer found thats origin appears to be maltese. was this caused by local EDM events that created the crater bays? For more on the topic of was or is the island of Malta the island of Atlantis you can visit the Atlantis website Atlantipedia and its page on Malta as a possible location of Atlantis that has more information and especially links to other historical sources on this intriguing idea. Were the Atlantis (Atlantika, Atlantide) islands Malta, Gozo, Filfla and Comino? The geological history of Malta seems to bear witness to catastrophism, for example cart ruts leading of cliffs. There is also the mythology or folklore of catastrophe events occurring with the creation of the island of Filfla from the Il-Maqluba crater and also Tas-Salvatur Hill (the Saviours Hill) also known as Qolla Tal-Merzuq (Ray of Light hill) on the island of Gozo. There are also no original people from any ancient era of the Maltese islands. No original folklore, mythology from the Temple Builders era. It is as if all those living on the islands of Malta were wiped out by some sort of catastrophe event. The island also has an incredible amount of megalithic temples for such a tiny island. Could Plato's island of Atlantis, Atlantika, Atlantide, be the islands of Malta? It is said that thousands of years ago a sequential number of cataclysmic earthquakes and volcanic eruptions crushed a chain of mountains that once joined Europe and Africa together (Pillars of Herculis). The ocean water disintegrated the lower land that once existed under the Mediterranean Sea. By time, the ocean water settled and the Mediterranean Sea was created. Obviously, the higher land survived the floods and several islands were formed. Thus, this new basin which came into being and which separated the two great continents became an arena of warfare and conflicts among the powerful maritime nations. This great catastrophe separated Malta and Gozo from the mainland and, thus, the Maltese islands were formed. Now, according to Plato's dialogues Timaeus and Critias, another catastrophic eruption occurred and the island of Atlantikos (the mother land) was submerged under the sea in the span of a single day and night. ... Fortunately, the theory that the Maltese islands in ancient times formed part of a larger island known as Atlantide is gaining acceptance among world-renowned scholars and researchers on this subject. The fact that on the Maltese islands we find several ancient temples (Il-Ggantija, l-Imnajdra, Hagar Qim) and the Hypogeum at Tarxien, proves that these ancient remains are more than a mere evidence that an advanced technological civilisation settled in Malta about 8,000 years ago. But more than that, the fact that Malta is not so distant from Greece and that the Maltese islands together with the volcanic islands of Pantalleria and Lampedusa fall exactly into the description given by Plato, shows that these islands are part of the skeleton of the country left floating in the central Mediterranean to bear witness of Atlantis. There are those who think that if this theory is proved scientifically then Malta can surely be referred to as the cradle of civilisation. At the same time, however, it will be a great challenge to local historians to rewrite and update our prehistory. Was Malta the island of Atlantis as Plato described in Timaeus? Another article on the idea that the Maltese islands of Malta and Gozo could be a good possible location for Plato's island of Atlantis. The incredible mysterious history of the Maltese islands, that has been wiped out by some means as there is no survivors or living ancient race of Maltese, may be a smoking gun of evidence that the islands were once an important and advanced civilsation of Temple Builders that was catastrophically destroyed. The only real known historical sources take us back to ancient Greek times, where the famous philosopher Plato had written about this iconic city in one of his renowned works called the ‘Timaeus’. Experts who believe in this ancient city’s existence thus agree with Plato and claim that the eradication of this city was indeed due to a tsunami. So why would Malta possibly be the perfect candidate? First of all, as many of us already know, Malta was not always an island, and we have ample archaeological evidence to support this argument. Archaeologists had discovered huge animal fossils, such as those of elephants, bears, reindeers and more, in places like Ghar Dalam, and this therefore shows that Malta must have been much bigger to have been able to provide such large animals with enough water and food. Therefore, Malta too had been destroyed by a huge calamitous wave. Secondly, Malta bears ancient structures that date back to over 9000 years ago, even claimed to be the oldest ruins in the world by many orthodox archaeologists. It is hence not much of a mystery why Malta might be thought of having been part of the alleged city of Atlantis! What locations in the Mediterranean sea might be the possible locations for Plato's island of Atlantis? The ancient islands of Malta, Thera and Crete are in that list. Malta has huge ancient structures that are now dated as 9000 years old or older and are said by orthodox archaeologists to be the oldest stone ruins in the world. Malta is now a small rocky island that once had elephants and shows evidence of having been destroyed in a huge cataclysmic wave. Joseph Ellul and others have proposed that Malta was part of a great civilization of the past, possibly Atlantis. Malta was probably connected to other parts of the Mediterranean when a huge wave from the Atlantic filled the Mediterranean, causing the Biblical Flood. Was Malta Atlantis? The island is far too small to have been Atlantis, but it shows that the Mediterranean was a very different place 12,000 years ago. According to the tourist literature in Greece, the explosion of the Aegean island of Thera destroyed Crete and at the same time, Atlantis. While Plato is quite explicit in his time frame and location for Atlantis (9,400 B.C. and in the Atlantic), Greek archaeologists seem certain that Atlantis can be found only a few hundred miles from Athens. Thousands of tourists come to Thera every year and drink the local Atlantis wine while they discuss Atlantis. For them, Atlantis will never be found anywhere else. What did happen to the amazing ancient Malta and Gozo civilisation that built the monstrous frees standing stone buildings that are called megalithic temples? How could and did such an advanced race of people totally disappear with no record? Are the remaining temples found on the islands of Malta and Gozo, the complete loss of the Temple Builders, the destruction and loss of land, be evidence that the islands of Malta may have been destroyed or had a catastrophe, the same as suffered by Plato's island of Atlantis? Finally, there is Malta. Malta has the most ancient temples in the Mediterranean area, and Malta’s culture was destroyed by a tsunami and earthquake.